I will admit, I give little consideration to lunch. I’m usually quite ready to eat by midday, but am loathe to stop whatever it is I’m doing. During the week, I usually eat at my desk. On the weekend, of course, there are others to consider—the whole family sits down to lunch together. I still try to hurry things along; I’ll pull out bread and cheese, pickles, and carrot sticks, and call it lunch. My husband is more relaxed about lunch, and often more willing to invest time in its preparation. One of his signature lunches is Dad’s Decadent Submarine Sandwich. The ingredients of one of these sandwiches varies, depending upon what’s in the refrigerator at the time. Yesterday’s included cheese, sauerkraut, dill pickles, tofu luncheon, jalapeño rings, mustard, and black olives. 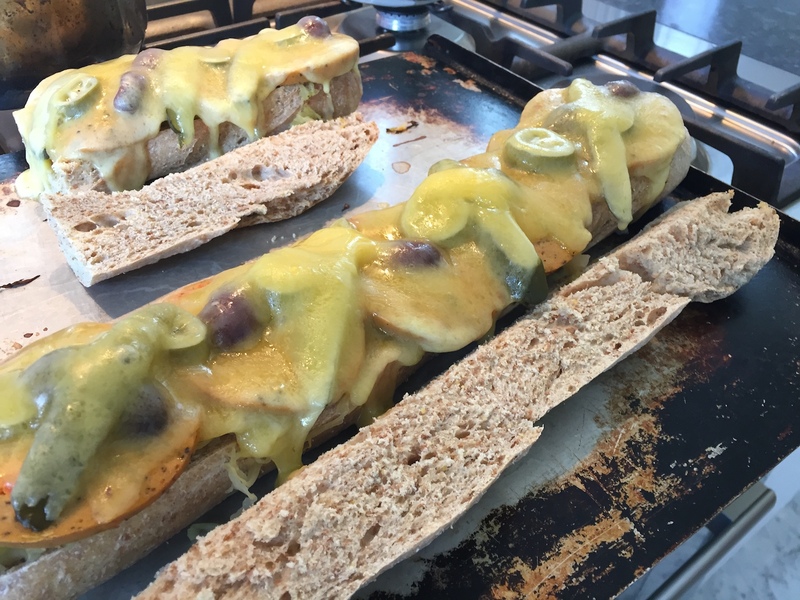 He generously piles all these ingredients into one of his wonderful baguettes and pops it under the broiler for a few minutes to melt the cheese.